RUBBER WASHER OD37.0 x ID12.0 x T3.5MM (20021230) ~ OM PLASTIC INDUSTRIES PVT. 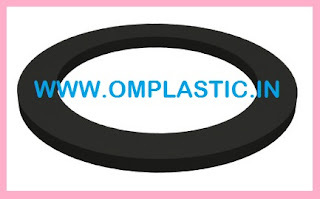 LTD.
Our firm is engaged in offering a premium quality range of Rubber Washer, which is primarily a flat Ring of Rubber to give tightness to joints. These washers also comprise flat disk, which is placed inside to prevent leakage. However, available in different shapes, sizes and thickness, these washers can also be customized as per the specifications laid down by our clients. These washers are widely used in domestic home appliances as well as commercial purposes owing to their features like elongation, excellent resilience and tear resistance. Coming with different resistance characteristics which make these last long against adverse environment, the superior sealing and cushioning support provided by these washers allows creating airtight seal between bolt/screw and surface areas.